This fall-inspired dessert is somewhat of a cross between traditional bread pudding and apple pie. This is an incredibly simple recipe to make and one that requires mostly pantry ingredients that many of us already keep on hand. I've made an abundance of bread pudding-style desserts throughout the years, but this one was declared "the best" by my husband and kids during recipe testing. And, I think I have to agree! Let me start by saying that subbing in croissants for run-of-the-mill bread when making bread pudding already is a game changer. 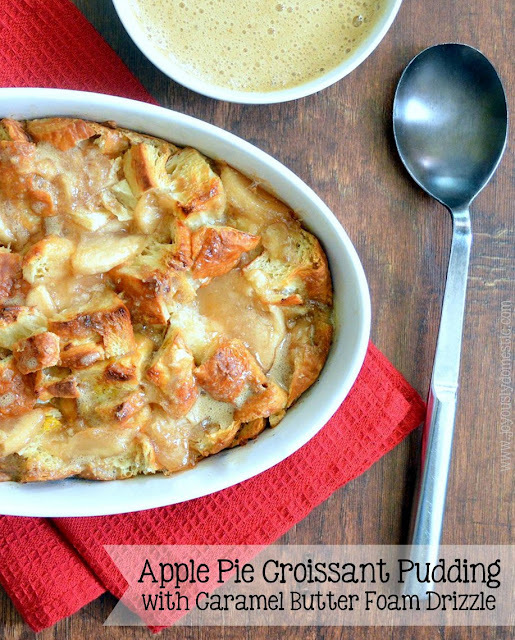 The inclusion of croissants takes bread pudding to a completely different level ... a really, really good level. So, this recipe is already elevated drastically because of those flaky, buttery croissants. I must mention that one of the things that turns me off from some bread puddings is that sometimes it tastes as if I'm eating bread baked up in sweetened scrambled eggs. (Anyone else?) Some recipes just simply call for way too many eggs. Here, you'll find that there is only one whole egg and one egg yolk in the custard, which results in no over-the-top egg-y taste or texture. Cinnamon, vanilla and nutmeg come together in the custard base to flavor up this dessert. (And, your house will smell awesome while this bakes, too.) Next, I break open a can of apple pie filling to dollop atop the dessert to really drive home the autumnal flavor. The highlight of this dessert has to be the sauce, however. I'm telling you, guys ... I don't even know how to describe it in words. It's so incredibly different than any other dessert sauce I've ever made, but I think it just might be the best. Something magical happens due to the addition of baking soda in the sauce. It gets all frothy and foamy. It's so insane in theory, yet it is definitely insanely amazing in taste. I beg of you ... do not skip the Caramel Foam Drizzle sauce. Spray a 9 x 13 baking dish with non-stick spray. Place cubed croissant pieces in baking dish. Set aside. In a medium mixing bowl, whisk together milk, cream, sugar, egg, egg yolk, vanilla, cinnamon and nutmeg. Pour custard evenly over croissant pieces. Allow to rest 10 - 15 minutes. Press down on croissant pieces to ensure they are moistened with the custard during this time, if necessary. Next, dollop pie filling atop croissant/custard mix. Bake 35 - 40 minutes. Remove from oven. Bring butter, brown sugar and buttermilk to a boil in a small saucepan set over medium heat. Boil for two minutes while stirring. Sugar should be completely dissolved. Remove from heat. Carefully stir in baking soda and vanilla. Serve immediately over/with croissant pudding. This was amazing. We skipped the apple pir filling, but it was still awesome. And, you are right ... that sauce is killer.